Every year, the joy of the holidays is disturbed by fires, accidents and injuries. 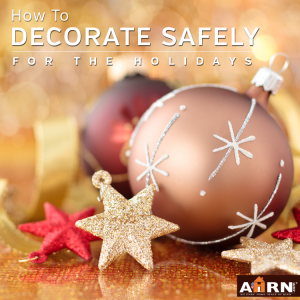 Keep the cheer in your home by following these simple holiday decoration safety tips. During the holidays, we fill our homes with additional objects and lights. While these decorations add to the feel of the season, they also introduce potential additional hazards. From Christmas trees to candles to electrical outlets, keep the happy in your holiday with some basic accident prevention. If you opt for a real tree, choose one with safety in mind. A fresh tree will have needles that bend not snap, have fresh resin on its trunk, and drop few needles. Choosing a fresh tree will reduce your fire risk as the tree will take longer to dry out. Whether your tree is real or artificial, it’s placement in your home is an important part of managing risk. Both types of tree should be kept away from fireplaces, heating ducts, and radiators. Placing them away from doorways or high-traffic areas prevents late night or early morning stumbles from bringing down the tree! Decorating your tree could also use a nod to safety. If there are pets or young children in the house, take care with breakable ornaments placed on the bottom third of the tree. In particular, replace hooks on hanging ornaments with ribbons for additional child safety. Twinkling Christmas lights are an iconic part of the season. They’re also a hazard to hang and result in a significant number of falling injuries every year. When using a ladder to hang lights, opt for one that reaches at least 3 feet above the surface you are decorating. Using the appropriate lights is an easy way to add a safety layer – if the holographic UL label is red, the lights can be used indoors or out. If the label is green, the lights are only safe for indoor use. To avoid electrical issues, make sure your lights are plugged into a ground fault circuit interrupter (GFCI) outlet. These outlets are designed to shut down if there is circuit overload, significantly reducing your chances of electrical fire. Avoid overloading circuits and power strips by carefully keeping track of the wattage you have plugged in. Check the instructions for each light set for details. Only using lights that are in good condition with solid wires and uncracked electrical plugs. Once you have your decorations set, take a good look around your house for items that could be a tripping or fire hazard.